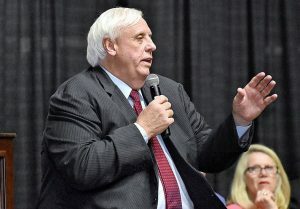 Governor Jim Justice speaks during the annual Beckley-Raleigh County Chamber of Commerce dinner Friday night at the Beckley-Raleigh County Convention Center. BECKLEY, W.Va. — Gov. Jim Justice returned to his home town as the featured speaker of the Beckley-Raleigh County Chamber of Commerce annual dinner Friday night, turning an abbreviated appearance into a campaign event and a defense of his business affairs.